Fortifeye Vitamins founded by Dr. Michael Lange is constantly involved in ongoing research and development of proper nutrition for total body and eye health. Their newest addition to the Fortifeye Professional line is Fortifeye Complete One per day. Dr. Lange wanted a very potent one per day vitamin that would act as a multiple vitamin and eye vitamin all in one. Fortifeye Complete One per day is a culmination of many years of research using vitamins with patients of all ages and all disease types. This vitamin supplement was developed for any one wanting to gain valuable nutrition through a one pill per day dosing. This supplement is all natural with no synthetic dyes, trans fats or synthetic nutrients. This is a combination multivitamin, eye vitamin, vegie /fruit blend and enzymes all in one USP certified tablet. One of the biggest changes in this one per day vitamin is the addition of Omni Actives Lutemax 20/20. This is a lutein / zeaxanthin isomer in a unique micro beadlet delivery system that is encased in the tablet. This allows for maximum absorption of the lutein and zeaxanthin isomers. Lutein and zeaxanthin when absorbed properly are beneficial to ocular health. To maximize the health benefits of lutein and zeaxanthin all beta carotene has been removed which also makes this an ideal supplement for smokers. Additional Vitamin D3 along with the eight forms of Vitamin e have been added to this new formula. Nutrients that exhibit anti veg f activity have been added like resveratrol, green tea polyphenols and curcummin to support retina health in macular degeneration and diabetic patients. Other nutrients to support healthy blood sugars like chromium, vanadium and cinnamon have also been added. Mitochondrial support to aid in ATP production and neuro protection is covered with acetyl l carnatine, coq-10, and alpha lipoic acid. Clinically tested doasgaes of of vitamin c, b complex, zinc, n acetyl cystein, lycopene, citrus bio flavonoids and bromelain have also been added for their many health benefits. A bio active High ORAC antioxidant blend using Gogi berry extract, spinach, kale, blueberries, bilberries, cocoa, grape seed extract, manogosteen and pomegranate have been added to increase the ORAC value to ten times the typical multivitamin. All of these nutrients are in an easy to swallow one per day dosing. These supplements have been checked carefully in bio availability blood studies to ensure maximum absorption into the cells occurs. To maximize absorption take with a meal and a good omega three fish oil like Fortifeye Super Omega is recommended to take along with the one per day. Fortifeye Complete One per Day is available at all Lange Eye Care locations in Florida and many eye care practices throughout the country. You can also go to www.fortifeye.com or call 866 503 9746 to purchase. 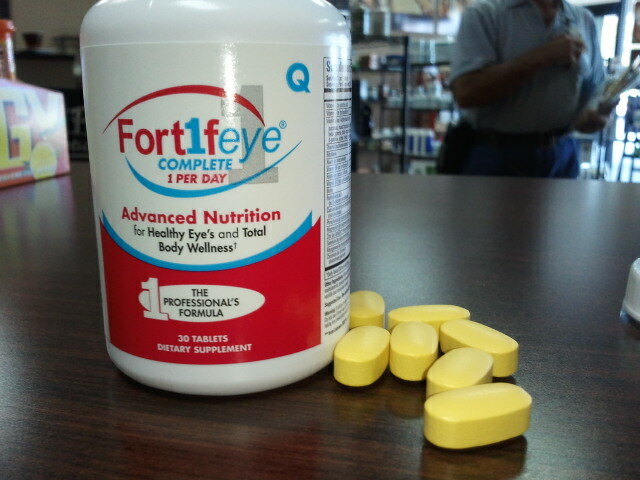 Isnt it time you took control of your health with Fortifeye Vitamins? This entry was posted on October 18, 2012, 12:47 am and is filed under Uncategorized. You can follow any responses to this entry through RSS 2.0. You can leave a response, or trackback from your own site. cant wait to try it. good job Dr. Lange.